Milton Thermosteel Flip Lid Flask is made of 100% stainless steel constructed inside as well as outside to keep the bottle rust free for longer lifetime, the silver coated steel is designed professionally and compact in size which makes it easy to carry in backpacks and hand backs. You can store any liquid substance in it, hot or cold and keep the temperature for up to 24 hours without any hindrance in taste, the bottle is strong and sturdy idle for rough use. It also has a unique flip lid that makes it easier to drink the beverages without spilling directly from the bottle, or if you want to pour the water into a glass or cups without spilling. Overall this product best for home or office use and day to day life. Now you can keep more beverages in your pocket and enjoy the refreshing warm, cold drinks with just a few clicks and sips. all you need to do is prepare the juices and pour it into the 1000ml flask. Go on a holiday trip or carry it to an office the flask can store up to 1000 ml of drinks at one go. You can enjoy more than 10 cups of refreshing beverages for 24 hours once the bottle is fully loaded. The flask is nor small neither so big, its perfect for the medium level beverage consumers, overall 1000ml capacity is perfect for everyone. Milton Thermosteel Flip Lid Flask comes with a unique flip lid to avoid spilling of beverages while pouring into the glasses, this unique flip lid also makes it easier to take a sip of beverages easily within the bottle itself and also without any fear of spilling. This flask makes it possible to have a cup of coffee even if you are travelling in a dwelling train or inside a car. It does help a lot then other flasks which don’t have the flip lid, so according to me this feature is must in every flask as it can make life a little bit easier. 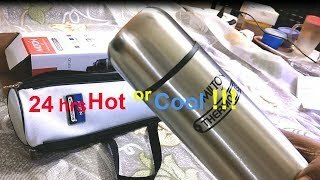 Milton claims that the flask can hold the temperature for up to 24 hours, but you’ll find a lot of reviews in Amazon product page that it can barely hold the temperature for 6 to 12 hours. However, according to our preview, we can say that it does hold the temperature for up to 24 hours but there is a condition for that. If you kept the bottle closed for 24 hours without opening the bottle in the middle it can hold the temperature without any doubt. The temperature loss happens when we open the bottle and if you frequently open the bottle to have a drink then it can not hold the temperature even for 6 hours. Well, it does happen with all of the flasks in the market. So according to me, this product works fine as per claimed by the manufacturer. Milton Thermosteel Flip Lid Flask has the sturdy body and strong built quality made of 18/8 stainless steel, the shape of the body is well balanced and durable. Quality of the steel is good and safe for the kitchen. Looks is as important as its features. And Milton Thermosteel Flip Lid flask is perfect for every situation, whether you want to carry this flask in your backpack or carry it in offices or travelling, you can easily bring it in front of everyone confidently. The round body and smooth finishing curve stainless steel strong body is impressive, in terms of its colour we don’t have much choice as this model only come with the steel colour. Milton as a renown flask manufacturing brand has introduced several types of models in the Indian market, all of them has its own unique features and facilities. Comparing other flask manufacturing brand Milton does provide good quality products at affordable prices. So if you want to buy a flask this might be the right one for you. Sleek bottle easy to use. Cap can be used as a cup.